You will be given a reference e-book to read which has 340 pages And the test will be based on that e-book , you can take the test only after 10 days Of &nbsp;purchase. Brand is the grand ambassador of a product that makes anything sell like hot cakes amidst tough competition. But creating and maintaining the brand name is not that easy as it may seem. Proper management is of utmost importance. It is not simply the name that matters but also includes various other aspects like design and packaging, customer relation and handling etc. This Brand Management Course would take you through all those things involved in creating a brand image, developing and maintaining it with utmost care and creativity. This online certification course takes you on a step by step learning process. The first step is to make you thorough about all the basics of Brand Name, its powerful world, what influence it has on the mentality of the customers because brand names are equally important to them as to the brand owners. It also talks about the basics of brand management and how the augmentation of internet technology has led to e – commerce and their impacts on brand name and brand management. With this you would be clear about the purpose behind branding and the effective role played by advertisements in this branding process. You would also explore another interesting market other than that which involves the branded companies and its retail customers. This market is one which many do not understand about in relation to brand and brand management. And this is the business to business market or technically termed as corporate branding. Next step would be to make you aware of the various strategies used in brand management. It will polish your thought process and creativity and make your every approach towards brand management as a complete professional. You will be made to understand all about building a brand, creating brand identity, brand equity and developing brand loyalty. You can simply put on the hat of the strategic brand management called the 5 P’s. The knowledge of this would take you a long way in developing a personal brand name and successfully seeing it at the top of the popularity. The next step is to be thorough with brand management, the role of brand names, the brand identity sources and ways and means of safeguarding your brand name. In the process you would get knowledge about the various issues and hurdles relating to brand name and its protections which includes various trademark issues. This part of Brand Management Course would also keep you updated about the current issues in brand management. To make it easier and clearly understandable, examples of actual companies would be provided along with their success stories and the methodologies applied by them. There would be many thought provoking sections that would stimulate your creativity and intellectual thinking that would help you go far beyond than normal circumstances. The next jump would be the various brand resources, what would be the expectations and approach of the customers, ways to convince them and develop a strong brand equity and the various inevitable issues that may affect your brand and finding out strategic ways to overcome such problems. The final step would make you feel a complete Brand Management Professional to the core. This will guide you in analyzing the various factors, the brand personality, how to measure the brand’s positioning and the brand’s association and motivational approaches that need to be effectively implemented. With this, you would be ready to take off to play key responsible roles as an expert. It is an Online Brand Management Course After you qualify in the Brand Management Exam you would receive Online Brand Management Certification. This would open the doors for various positions in the branding industry starting from Associate Brand Manager, Assistant Brand manager to Brand Manager and even senior managerial level. You can expect the salary to start from $ 95,000 and can go upward up to $ 130,000. A job of Brand Manager is quite interesting and a multifarious job that requires utmost understanding and strategic application of thoughts, ideas, skills and approaches in appropriate places at appropriate timing. 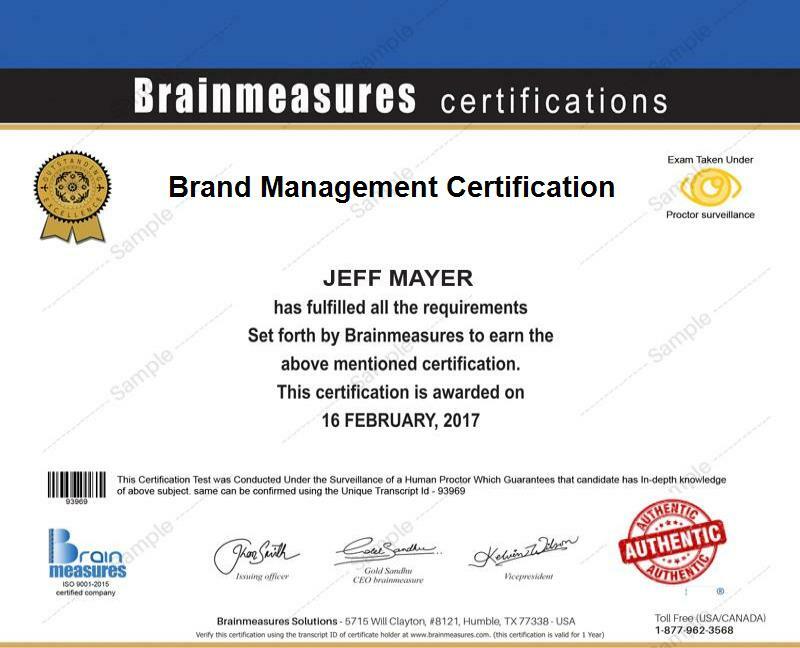 Once you are thorough with this Online Brand Management Certification course be confident that you would prove to be the best in the industry. You would be well equipped with all information, ideas and strategies which you can aptly apply and handle any kind of situations with great expertise.